Motorcycle stunt riding, sometimes referred to as simply stuntriding, is a motorcycle sport characterized by stunts involving acrobatic maneuvering of the motorcycle and sometimes the rider. Common maneuvers in stunt riding include wheelies, stoppies, and burnouts. Sport bikes have become a common vehicle for stunts. Stunters are a controversial subculture of motorcycling. 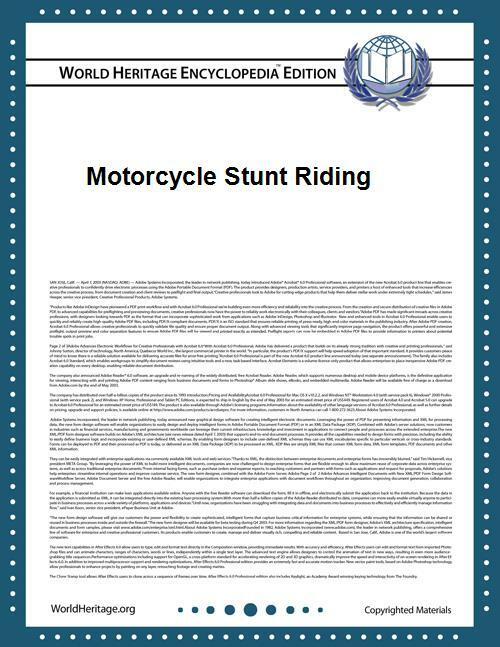 Stunters perform motorcycle stunts on sportbikes, both on public roads and in private venues. Some stunters have organized commercial teams. A wheelie on a motorized vehicle is nothing new. In drag racing they are considered a problem, robbing power that could be used to accelerate the vehicle faster, and many classes of drag racing use wheelie bars to prevent them. But those are for vehicles specifically built for drag racing, which rarely are street-legal, or unmodified from stock. In contrast, since at least the 1970s, some motorcycles straight from the showroom floor were able to be wheelied. In the late 1980s and continuing today, motorcycles, and especially sportbikes, have become lighter and more powerful, and have therefore become easier to wheelie. Other stunts have also become possible if not easy with the advancement of motorcycle technology. As Martin Child wrote in Bike, "With lighter, shorter, better-braked bikes on the market, the stoppie has never been so easy for so many." But at the same time, the cost of a motorcycle has remained relatively low compared to other street-legal vehicles with similar power-to-weight ratios. In the 1990s some riders made performing stunts the primary focus of their riding. A wheelie or other stunt was not just something to do while riding, it became the main goal in riding. Frame sliders — These large knobs are attached to a motorcycle's frame to protect the fairing from damage should the rider lay down the bike. Also used by many non-stunters. Frame sliders should not be considered a substitute for a cage when learning how to stunt. Although Frame sliders will reduce the damage to the plastics and certain parts of the bike they are not enough to keep from cracking motor cases and or cracking the frame itself. Crash cages — These cages provide more protection from damage than frame sliders. Mostly used by stunters. There are many examples of cages on the market today and a vast array of different designs and styles. It is very important to check around based on the type of bike you have as to what cage will work best at maximizing the protection for your specific motorcycle. A cage should be one of the first things purchased when learning how to stunt due to the fact that most drops and falls will occur during this time. Subcages — Subcages are very similar to crash cages, but for protection of a different sort. While crash cages are protection for the frame itself, motor mounts and cases subcages focus on protecting the subframe of the motorcycle. In certain subcage applications will also eliminate the stock passenger pegs and relocate them to a different spot which is more becoming for staggered stance wheelies among other tricks. These pegs will in some cases be solid mounted to eliminate the possibility of them folding up on the rider when doing wheelies on the passenger pegs. front Upper Stay — Meant to replace the upper stay on the motorcycle which usually holds the upper fairing and gauges in place. This is only necessary when running a full fairing bike and is meant in like fashion as both the subcage and crash cage to protect the front of the bike and provide increased stability for the front end of the motorcycle. This will not save the front fairing from damage. 12 o'clock bar — 12 bars, as they are referred to, are commonly used on stunt bikes. These bars attach to the subframe of the motorcycle and are used when 12ing the bike. These bars are meant to scrape the ground in place of the exhaust or tail section. Furthermore, with the introduction of the 12 bar came an array of bar tricks which all occur while the motorcycle is resting on the bar itself. These tricks include but are not limited to the ape hanger, watch tower, and various other acrobatics while the bike is on the bar. Only used by stunters. Round bar— A variation of the 12 bar, round bars are becoming more and more popular nowadays with riders straying away from bar tricks and increasing the technicality of Circle combinations. A round bar is the same principle of a 12 bar as far as scraping the bar instead of the tail section or exhaust with one difference. The round bar is just that, its a curved bar that hugs the contour of the motorcycle tail section with no flat sections. The "circle" is a wheelie performed traveling entirely within a circle, which is very difficult to do. Even more difficult is a circle wheelie with the rider's right foot on the left peg, which is called a "Ralph Loui". The "high chair" is a wheelie with the rider's legs over the handlebars, while a "tank wheelie" is one in which rider sits on the tank with legs spread. A "frog" is a wheelie in which the rider stands on the tank, and a "seat stander" is performed with the rider standing on the motorcycle's saddle. Standing on the windshield while riding the bike at 12'oclock is called a "watch tower". The "12 o'clock" is a very high wheelie, past the normal balance point of the motorcycle. A variation of this is the "coaster", in which the bike is balanced without the acting force of the motor, that is, with the clutch pulled in. The motorcycle is pulled so far back beyond the balance point of the wheel that the rider must constantly ride the rear brake to keep his machine from falling over backwards, causing him to slow down. A rider can pull in the clutch to create the effect of a wheelie with no engine noise. Conversely, some riders will pull in the clutch and peg the engine on its rev-limiter, called a "rev-limiter coaster". The opposite of the 12 o'clock is a wheelie in which momentum is used to lean forward, lifting the rear wheel while continuing to move forward at a high speed — this is called a "nose wheelie". A wheelie performed by two or more men on the same motorcycle is called "man-dom". Ape Hanger — Hanging from the bars with one's hands while doing a 12 O'clock, scraping the bike's 12 o'clock bar and allowing the riders feet to drag behind the bike. Cliff Hanger — Hanging from the bars with one's feet while doing a 12 O'clock. Stoppie — Lifting the rear wheel of the motorcycle using momentum and braking force. Also referred to as an Endo. Biscuit Eater — Stoppie with the rider's legs over the handlebars. Also known as the "highchair endo"
Burnouts use the power of the engine and braking force to cause the rear wheel to spin, heating the rear tire and producing smoke. There are different types of burnouts, like the "suicide burnout" with the rider dismounted and standing in front of the motorcycle. The "chainsaw" is a form of burnout performed by the stunter standing beside a motorcycle lying on its side holding the motorcycle exclusively by the right handle bar then causing the bike to "orbit" around the rider while maintaining control during the burnout. In a "merry-go-round", the rider lays the bike on its side and climbs onto it, then leans back on the bike while holding the throttle, causing the bike to spin round while doing a burnout. Switchback — Any stunt performed with the body facing the rear of the motorcycle, opposite the direction of travel. Christ — A stunt performed with the rider standing straight up on the seat or tank of the motorcycle with both arms extended while the bike is in motion. Also called a "Jesus Christ" or a "Cross". Can be combined with a switchback. De activator — Riding a wheelie on idle and jumping off the back of the motorcycle. Doug Domokos (1955–2001), "The Wheelie King" — held the record for longest wheelie for 8 years after a 145 miles (233 km) wheelie at Talladega Speedway in 1984. Among his other performances were the movie Cannonball Run and wheelies up and down Lombard Street (San Francisco). Cytrix, a display team formed by members of the White Helmets at the end of World War II, toured for 20 years up to 1967. They toured mainly the UK, but also on two occasions the US (across 23 mid-west states over 4 months) and Europe. They appeared at UK agricultural shows and at Wembley on a number of occasions during the Speedway finals. The four consistent members of the team were Basil Shelbourne, Ted Way, Jet Jones and Neil Hack. Originally they rode Matchless bikes but later rode BSA Gold Stars. Stunts were typically run at speeds of 60 mph and included tunnel-of-fire jumps. They rode without crash helmets or leathers, just shirt, tie, jodhpurs and riding boots.